Have you seen this icon, and then wondered what it is used for? This is an icon used for RSS feeds. 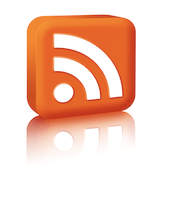 What are RSS feeds? RSS is a short abreviation for Really Simple Syndication. If you like my blog posts? Subscribe to my RSS Feeds. If you have found a blog that you would like to follow, subscribe to their feeds. Here are 5 reasons why I think it is important. By subscribing to a bloggers or website’s RSS feeds you are proving to the blogger/website creator that you are interested in their material and appreciate their content. Many hours often go into blogging and loyal subscribers help make a blogger feel that all of their time and effort is worth, because people are in fact, really listening. Every time a new post is published, RSS feeds will give you immediate access. It is one of the best ways to keep track of blogs that you enjoy without clicking through their site to find new information that appeals to you. One RSS reader that I really like is Google Reader, but there are others such as: blogspace.com, bloglines and FeedLounge. Feed reader lists others that are available as well. RSS feeds are also easier to follow on mobile devices making the content available almost anywhere you are. I like the way , Julie Salgado explains it on her website: iamjuliesalgado.com.